"Summer Type Weather Returns To The Northern Forest!" Strange year here, with the official beginning of Fall, Summer type weather has returned. Cool humid mornings giving way to hot humid afternoons. These weather conditions result in early morning fog and clear beautiful sunsets. The Canada Geese have been migrating south this week with many V shaped flocks flying over here filling the silence with their loud honking cheers of goodbye. The Humming Birds have also departed and I miss seeing their presence at the feeder. However, with the departures are also the returns and this week the Grey Jays have been frequenting here quite often through the day and are making their best effort to interact with me. These little creatures are a real pleasure and company. The forest is starting to show brilliant Fall colors with vibrant reds and yellows standing out against the contrast of the greens of the pines.With the pastel blues of the sky and the deep blues of the lake makes for a very beautiful panorama of Nature! Luckily, I was able to get three teams in for at least one training run each on last Sunday & Monday. All 24 dogs , that comprise of those three teams, are performing great. Especially for so early in the season. With video review, I am selecting the young dogs that have the potential to be Leaders and will receive further training this season at that position. The weather forecast, if it holds true, for next week looks good to continue training. With training being suspended this week, I was able to fill in my free time with preparing food for the next while and freezing some for the upcoming Winter. Let me leave you with anther video of the dogs running. "Death Comes To The Northern Forest!" With the coming of Fall, the trees and the vegetative plants leafs turn to brilliant colors before they fall to the ground. The flying insects and grasshoppers disappear, the migratory birds head south to escape the Winter's wrath and the forest takes on the look of death. But, this is just the illusion of death. As the snow blankets the forest, the gestation period has begun and with the coming of Spring the rebirth of the forest brings new hope and new beginnings. Life in the forest just went in a dormant state giving it a period of rest. That is the miracle of the "Cycle of Life"! However, it is just the opposite with Dog Mushing! It is this time of the year that fills with excitement! Plans and hope for the upcoming season are resurrected and come to life. This is a great time of year when the dogs and mushers feel their spirit rekindled and the Fall Training commences. All else is forgotten, as the focus now is the new season. The training/conditioning here has already started, earlier than normal, with morning temperatures conducive to safe running. We, here at Miortuk, start the dogs running in teams when the temperature are below 10 Celsius and with low humidity. If the temperatures are higher or the temperature plus humidity makes for a greater than 10 Celsius humid-ex reading, the dogs are not run to prevent the possibility of over heating. Early training/conditioning is very important not to over task the dogs to ensure their health and well being. The upcoming races might not be won with early Fall training, but it can be lost with over extending the dogs. It is very important to temper enthusiasm with patience in order to produce a healthy, enthusiastic team of dogs. The early runs here are with small teams of 8 dogs, slower speeds and a small break at the halfway point of the training circuit. The dogs also need time to rest and restore the muscles before the next training run. The team size will increase when Cecile returns from France. That way there is the two of us to safely hook up and run the dogs. Videos are taken of all the early runs, later in the season only once a week, so we can analyse the individual dogs performance. This assists us in making decisions for positioning the dogs in the team and with which partners they run with for them to feel comfortable so they can deliver their best performance. This analyse is critical to producing a well tuned team. 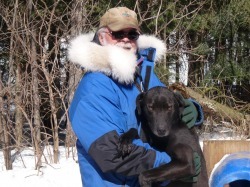 This also a critical time for us mushers to develop that crucial working connection with the dogs that will make up our individual racing teams. With Cecile's arrival, we will also start introducing the young dogs to the regular routine of training. As you can clearly see running dogs is not easy. If it was, everybody could do it! These canine athletes need the same attention to details as human athletes, if we wish them the opportunity to reach their maximum performance. Enjoy the video and let it serve to let you experience the trill of running a team of dogs! Yes, it was a great week here, especially with the start of the running season with the dogs. The first few hook ups are always chaotic with the dogs being over excited and the musher uncoordinated. But, by the second hookup, all starts falling into place. The dogs remember what they are supposed to do and the musher gets back into the hook up routine. I ran three teams of 8 dogs this week and they all did great, especially on the second run. The temperatures were cooler and the dogs were back into their rhythm. Either, I am getting weaker or the dogs are getting stronger as they are certainly a handful to hook up. Ha! Ha! We are running 4.5 miles with a sort break at the half way and at an average speed of 15 mph. This is the routine for conditioning. The weather this week was some cool nights and then a return of warm humid temperatures. We had some rainy days and a 8 hour rain on Saturday afternoon into the evening. I witnessed the first flock of Canada Geese this week migrating south for the Winter. The Humming Birds have increased their feeding and as of Sunday they have also migrated south. Also today, I witnessed the return of the Blue Jays and the Grey Jays to the chalet. An update on Hinto, his first run of this season was fantastic and is proof that it is important to be patient with young dogs as they all mature at different times. He was fast,smooth, focused and very comfortable in the team. This weeks dog is Halona. She is the sister of Hurit, Hok'ee and Hinto. She is the princess of the litter and the slowest to mature into a running dog. She is very intelligent, quick learner and loves to please. At the end of last season, we got her running in the team. However, she was not really pulling to hard consistently. This season, she hasn't been hooked up yet which is driving her crazy. I feel confident, when she is hooked up, she will have the desire to perform. Halona has a very athletic physic and is a very smooth runner in the kennel. She loves attention and I hoping the this desire will inspire her to perform. "Rebirth Of A New Season In The Northern forest!" Today, training/conditioning started for a new season of running the dogs. Due to the temperature (10 Celsius or lower) we were able to get in only one run. However, it was a good run with an 8 dog team. This is the earliest date we have been able to run. The dogs ran great. However, the hookup and start was chaotic! FUN! FUN! I will post photos when the internet allows. This past week was stormy, hot and humid. A stark change from this morning. With stormy weather, I get a little creative in the kitchen. Not necessarily good for the diet. HA! HA! The dog, I would like to introduce this week is Hinto. Hinto is Hok'ee's brother. He is a very friendly playful dog in the kennel and as such was a little slower to mature as far as running. However, last year he showed great progress by the end of the season. He is very fast and smooth running. I would expect him to do well this year and get some race experience.